Every household makes regular use of glues and adhesives to bond materials together or to fix broken items. 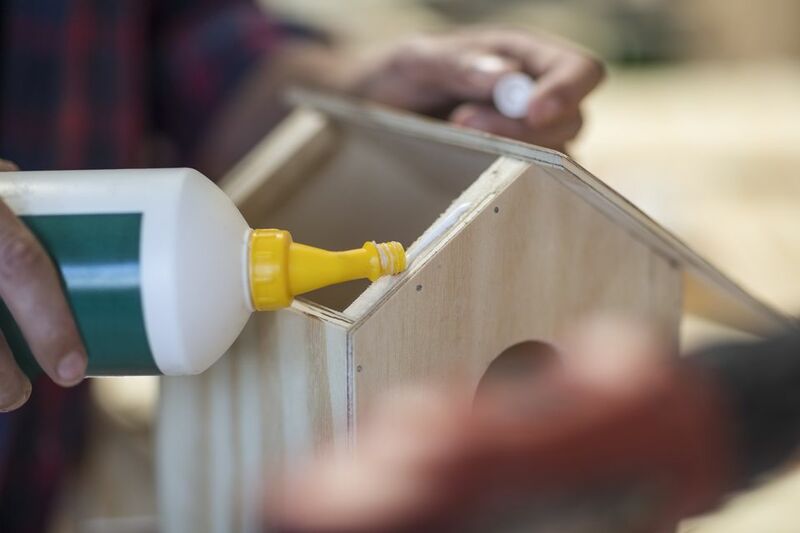 Glue can create masterpieces in the hands of a creative child equipped with art materials, and it can save the day when a lamp is broken, an acrylic fingernail comes off, or a tile comes loose in the bathroom. 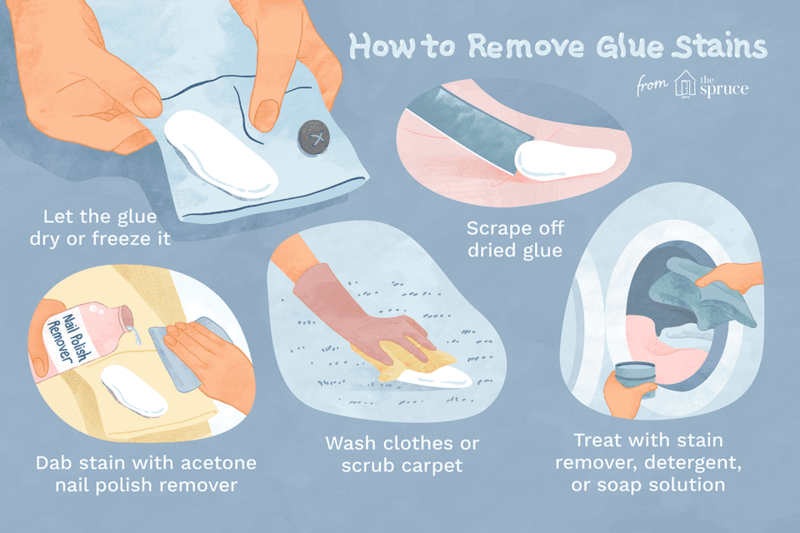 But as great as glue can be, when it lands on your clothes, upholstery or carpet it can be a disaster—unless you know the secrets of stain removal. Most of the time, glues and adhesives can be removed from washable clothes and carpet. But if any type of glue lands on clothes labeled as "dry clean only," head to a professional dry cleaner and point out the stain to get the best results. Commercial adhesives, sometimes called construction adhesives, can be very difficult to remove from clothes. That's why you should always wear work clothes and cover carpet and flooring before tackling home improvement projects. If you are messy or accident prone, buy the adhesive remover or solvent at the same time you purchase the adhesive! If a spill happens, it is best to allow the adhesive to dry on the fabric or carpet before attempting to remove it. Wiping at wet adhesive will only drive the adhesive deeper into the fibers. Use the edge of a dull knife or plastic scraper to lift away any excessive globs of glue, then let the area dry. For clothes, place the garment in the freezer. Once the glue is frozen solid, you can usually break most of it off the fabric. Then treat any remaining stain with the solvent or a stain remover and wash as usual. For carpets, try freezing the adhesive with some ice cubes in a plastic bag. You may be able to break it away once the adhesive is frozen. Then use the recommended adhesive solvent following the directions. Always test the solvent in a hidden area to be sure the carpet is colorfast. Artificial nail glue is basically the same chemical formula as super glue. The main ingredient is cyanoacrylate, an acrylic resin that cures almost instantly. When spills happen on fabrics and carpet, don't panic and start wiping at the glue—you'll only spread it around. Allow the glue to dry before attempting to remove it. Warning: Acetate, triacetate, and modacrylic fabrics dissolve in fingernail polish remover, acetone, or paint thinner. Always read the fiber content labels first! Using these products will create holes that cannot be fixed. To remove nail glue from these fibers, consult a professional dry cleaner. Dip a cotton swap in acetone-based nail polish remover (the more gentle ethyl acetate removers will not work) and test on a small, inner seam to make sure the nail polish remover does not damage or discolor the fabric or carpet. Working from the outside of the stain to the inside, dab the hardened glue with the swab, letting the swab sit on the glue for a minute or two. Use a dull kitchen knife to scrape away any loose glue. You may need to repeat this process several times as the glue is lifted. When you feel all the glue is gone from washable fabrics, treat the area with a remover or a bit of heavy-duty laundry detergent and launder according to fabric care label directions. Check the stain before placing the garment in the dryer; you may need to retreat if the stain is still present. Drying on high heat will set the stain and make it impossible to remove. After the glue is gone, mix a solution of one cup warm water, one teaspoon liquid dishwashing detergent and two tablespoons distilled white vinegar. Dip a clean white cloth, paper towel, or sponge in the solution and give the area a quick scrub. Blot with a clean cloth dipped in plain water to rinse. Allow the stained area to air dry. Glitter glue is a combination product, joining simple white "school" glue with dyes and glitter that can make stains even harder to eliminate. Techniques for removing glitter glue from washable fabrics vary, depending on if the glue is wet or has dried. If the glue is dry: use a dull knife or the edge of a plastic credit card to remove as much of the dried glue as possible, then treat following the steps below. Start by flooding the area with cold water. White glue is a protein stain and hot water can "cook" the protein and make it more difficult to remove. Next, mix a solution of oxygen-based bleach (brand names are: OxiClean, Nellie's All Natural Oxygen Brightener, or OXO Brite) and cool water, following package directions. Completely submerge the garment and allow it to soak for at least eight hours. This step will remove the dye component. If, after soaking, the stain is gone, wash as usual. If it remains, mix a fresh solution and repeat. Use a tool with a dull edge to lift away as much of the glue stain as possible. Mix a solution of oxygen bleach and warm water. Saturate the stained area and allow the solution to work for at least one hour. Wipe away with a clean dry cloth. If dye remains, repeat with a fresh solution of oxygen bleach. Once all of the dye is gone, sponge with plain water and allow the carpet to air dry. Hot glue guns and sticks are a crafter's best friend. However, hot glue resin and fabric don't mix. If you have some time, placing the glue-stained fabric in the freezer overnight will make the hot glue brittle enough to scrape away with a dull-edged tool or your fingernail. Goo Gone, a commercial cleaner, can be used to remove any remaining residue and then wash the fabric as usual. If you don't have time to wait, acetone can be used to remove the glue. But remember, acetone or fingernail polish remover CANNOT be used on acetate, triacetate, or modacrylic. Take garment containing these materials to a professional dry cleaner, because no home glue removal method is safe for these fabrics. Acetone will dissolve the fabric! For other washable fabrics, place a white towel under the stain. Dip a cotton swab in the acetone. Working from the outside of the glue stain toward the inside, keep dabbing as the glue transfers from your garment to the cotton swab. Use a clean swab as the glue is transferred and keep working until all traces of the glue are gone. After removing the glue, wash the garment as usual. Rubber cement is great for crafting but can leave a stain on clothes. Scrape off as much rubber cement as possible from the surface of the fabric using a dull edge. Do not rub the stain because it pushes the glue deeper into the fabric. Treat the area with a stain remover or a bit of heavy-duty laundry detergent then wash in the hottest water approved for the fabric. Use a tool with a dull edge to lift away as much of the rubber cement as possible. Mix a solution of one cup warm water, one teaspoon liquid dishwashing detergent, and two tablespoons distilled white vinegar. Dip a clean cloth in the solution and give the area a quick scrub. Rinse with a clean cloth dipped in plain water. It has happened to nearly all of us: a kid's sticker gets left on a shirt accidentally and goes through the clothes washer or worse, the dryer. Usually, the paper part of the sticker washes away in the washer and you're left with the residue or adhesive that is used on the back. Quite often, the adhesive has attracted dirt or lint and the stain looks almost black. Begin by heating undiluted white distilled vinegar in the microwave until it is quite warm. Use a sponge and saturate the sticker area with the warm vinegar. Allow the area to "soak" in the vinegar until the adhesive loosens. Rinse the stain with cool water. Treat the area with a stain remover and wash as usual in cool water. Cool water (no more than 40 degrees) will help ensure that heat from the wash doesn’t set in the stain. Check the area before putting the clothes in the dryer. If any residue remains, repeat the treatment. Do not put the garment in the dryer until all adhesive is gone. If the garment has already been through the dryer, it may take several attempts with the hot vinegar to remove all of the residue. Another method to try is to blot the stained area with rubbing alcohol before washing. Make sure, though, to test this treatment on a hidden area to make sure the fabric is colorfast. You can use the same hot vinegar treatment on a carpet. Saturate the area and let it work for five or ten minutes. Blot away with a paper towel and rinse with plain water. Repeat if necessary and let the area air dry. Warning: Clothes made from acetate, triacetate. or modacrylic fabrics dissolve in fingernail polish remover (acetone) and paint thinner. Even if the clothes are only an acetate blend, a hole will appear and cannot be repaired. Consult a professional dry cleaner for any of these fabrics. Allow the glue to dry completely before attempting to remove it from fabric. Dip a cotton swap in acetone-based nail polish remover and rub the swab on an inner seam to make sure the remover does not damage or discolor the fabric. To keep the stain from spreading, work from the outside of the stain to the inside dabbing the spot with the swab. Use a clean swab as the glue is transferred. You may need to repeat this process on both sides of the fabric. When you the glue is removed, rub a bit of heavy-duty laundry detergent into the stain and wash as usual. Check the stain before placing the garment in the dryer; you may need to repeat the cleaning steps. High heat from the dryer will set the stain and make it impossible to remove. Use the acetone and cotton swab cleaning method described above to remove super glue from a carpet. After the glue is gone, mix a solution of one cup warm water, one teaspoon liquid dishwashing detergent, and two tablespoons distilled white vinegar. Allow to air dry. Repeat the steps if necessary. White school glue is a staple for every kid and crafter. Fortunately, the stains are fairly easy to remove. White glue is a protein stain that can be removed by soaking and rubbing the stain in cold water before washing. The stains are easiest to remove if treated while fresh. Use a dull knife or tool with a plastic edge to remove as much of the glue as possible from the surface. Do not rub because this will push the glue deeper into the fibers. Flush out the glue by holding the fabric under running cold water and then wash. On carpet, repeated soaking and blotting with a wet sponge will often do the trick. If the stain is dried or old, scrape off any crusted matter, then soak in cold water for 30 minutes before washing fabrics or wetting and blotting a carpet.